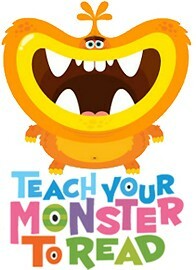 Teach your Monster to Read is a series of games designed for young children to practice the first stages of reading. Combining top quality games design with essential learning, "First Steps", "Fun With Words" and "Champion Reader" will help children understand the relationship between sounds and letters through a step-by-step scheme using a process by which sounds are blended together when reading. These games have been provided by the Usborne Foundation, a charitable fund established by Peter Usborne (founder of Usborne Publishing) to support initiatives to develop early literacy. The computer version is 100% free and profits from the app are put back into the Usborne Foundation to continue to create new and exciting ways for children to learn. Create a monster and take it on an adventure through a magical world.